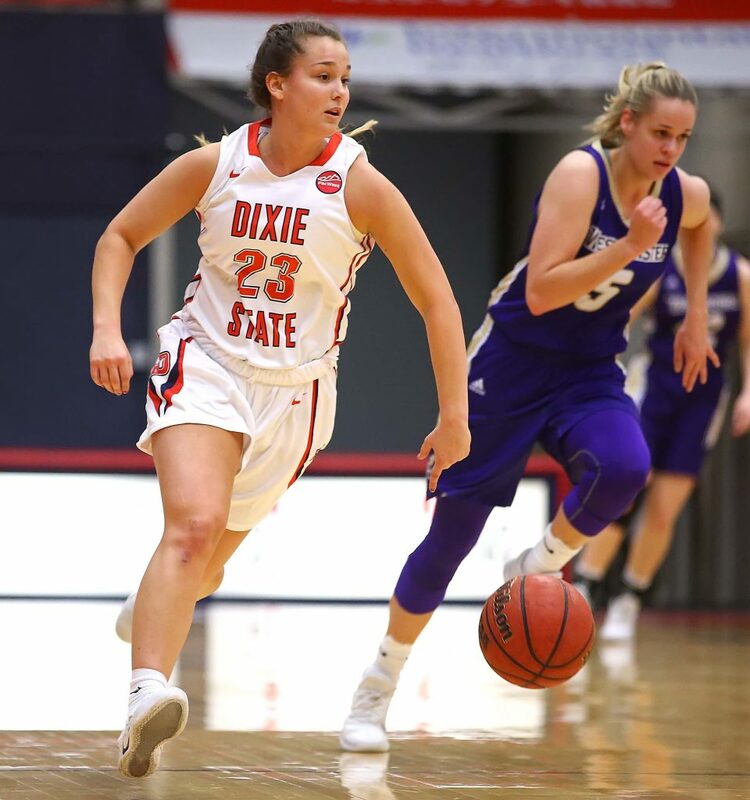 ST. GEORGE – Taylor Moeaki hit a 13-foot jumper with 4.3 seconds to play to help lift Dixie State to a come-from-behind 64-62 win over future RMAC rival Westminster College Friday afternoon at Burns Arena. The win moves the Trailblazers to 4-2 on the season, while the Griffins dropped to 1-3. 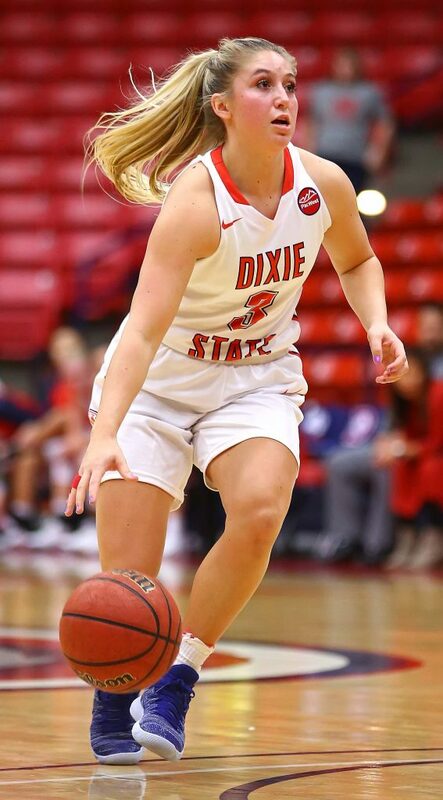 Dixie State fell into an early first-quarter hole as the Griffins began the game with a 16-5 run on their way to a 24-18 lead after the opening 10 minutes. However the Trailblazers would lock Westminster down over the next two periods, outscoring the Griffins 33-20 while holding Westminster to 31 percent (8-of-26) shooting. They led 51-44 heading into the fourth quarter. 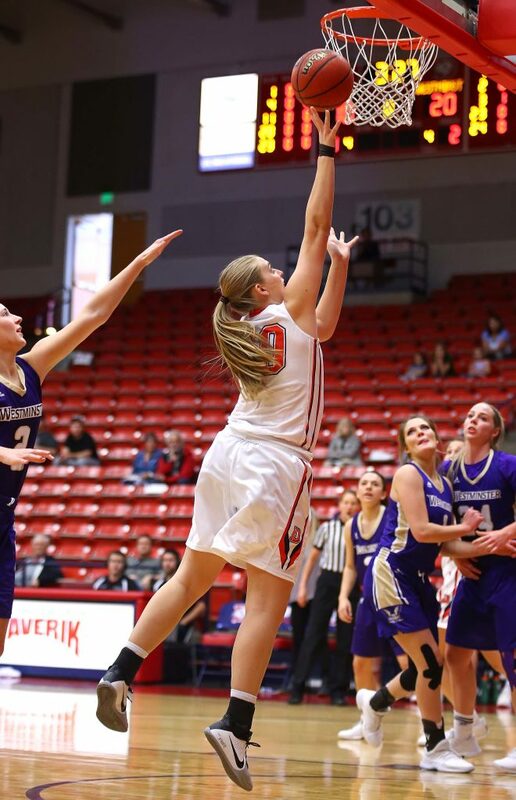 After Westminster took a double-digit lead early in the second quarter, 28-18, the Blazers began to chip away at the deficit. They closed the gap to 35-32 by halftime after an Ali Franks steal and lay-in. Franks combined with Tramina Jordan to score nine points during the run. 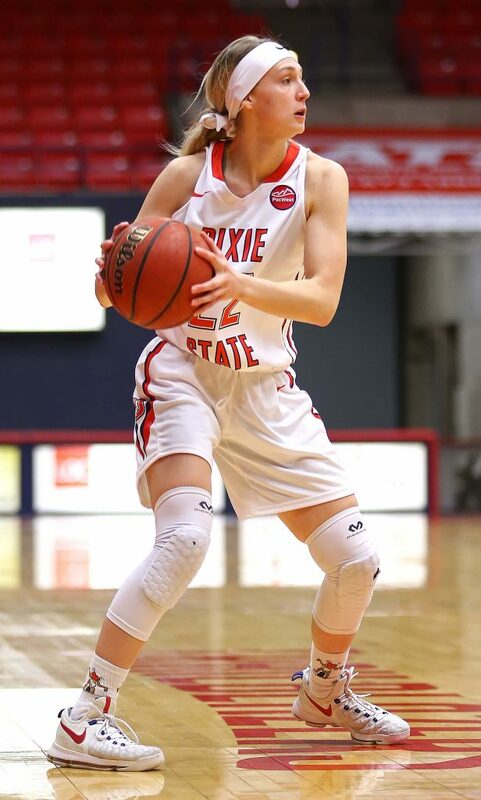 The Trailblazers came out of halftime outscoring the visitors 11-2, including seven quick points from Maile Richardson and another four from Moeaki, and would extend to a 51-42 advantage Matti Ventling nailed a trey with 43 seconds remaining in the third. 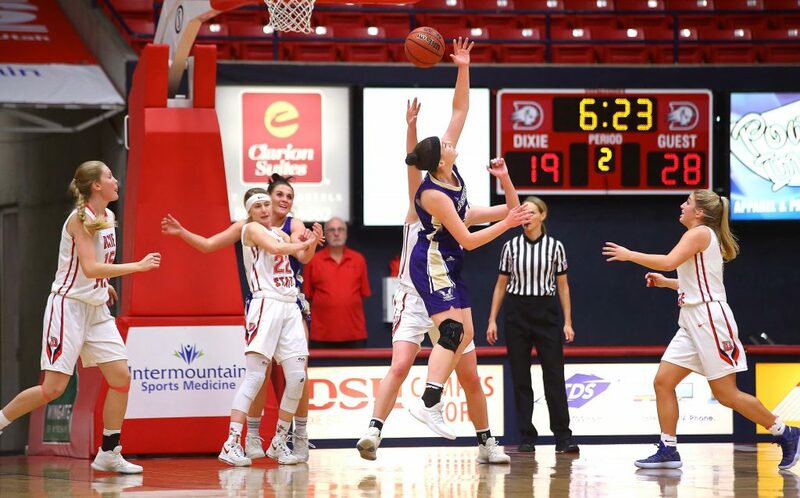 The Griffins would respond with a 12-2 spurt, scoring the final two points of the third quarter and 10 of the first 12 of the fourth, to reclaim the lead at 54-53 with 7:21 to play. 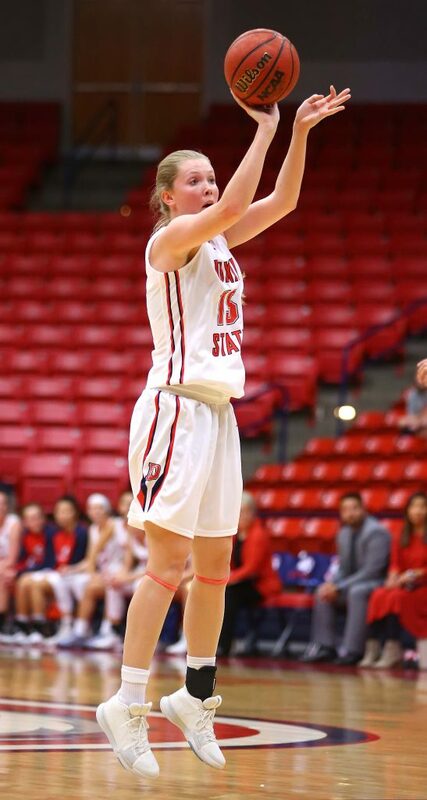 Kristin Baldwin’s putback with 1:27 remaining put DSU up a point at 60-59. 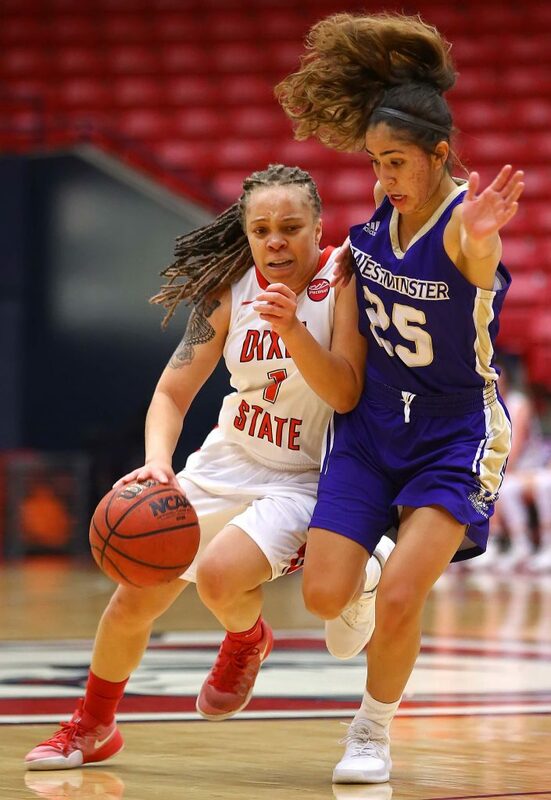 Westminster would regain the lead on its ensuing possession with a 3-pointer, but Moeaki answered on DSU’s next trip down the court with a jumper to knot the score at 62-62. The Trailblazers then got a crucial defensive stop to regain possession with a chance to win it in regulation. 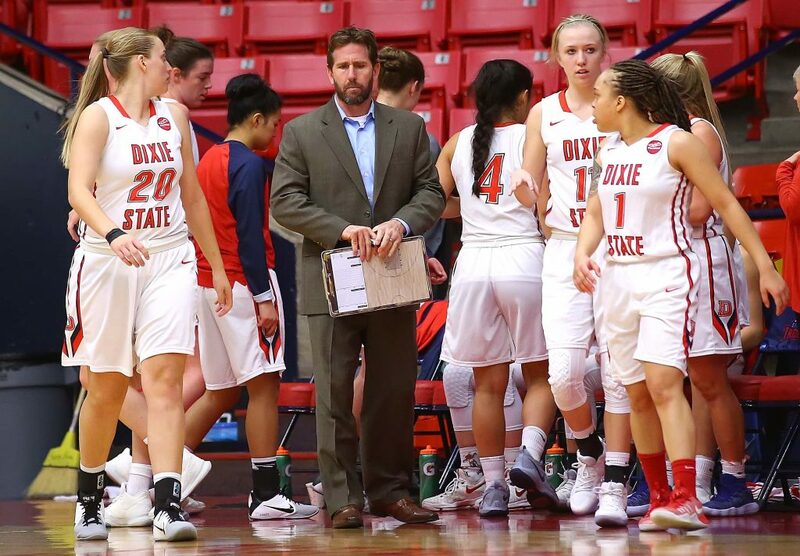 DSU head coach J.D. Gustin called a 30-second timeout to draw up the final play. 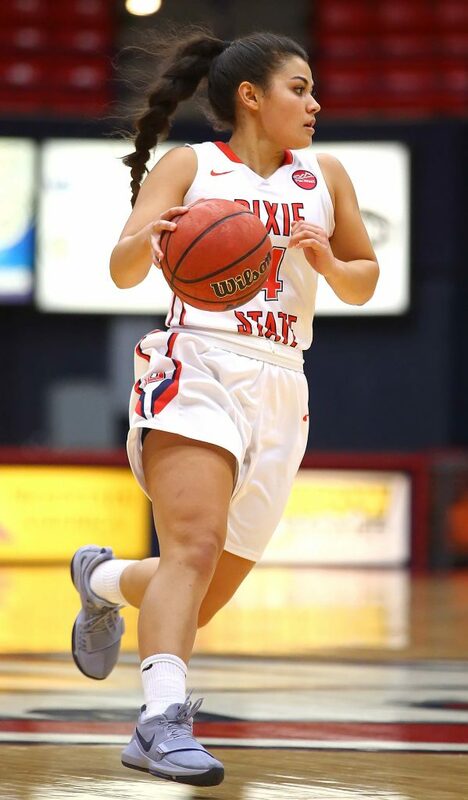 After the Blazers drew the clock down to under 10 seconds Moeaki pulled up for a shot from the left elbow that caromed long off the iron back to the freshman guard, who then floated in the go-ahead jumper to take the lead with four seconds remaining. 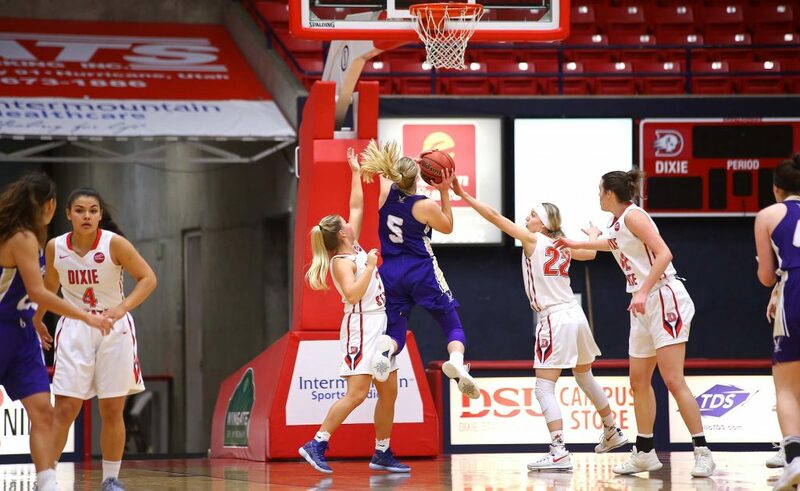 Westminster had one more shot to tie or take the lead, but the attempt bounced off the rim and Baldwin pulled down the rebound to secure the win. “Our plan was to create tempo. We play contrasting styles with Westminster, but they [beat us] in the first quarter playing our own style,” Gustin said. “We had to back off of that a little bit and that got us back into the game. Credit to [Westminster], they got every 50-50 ball, they were flying around and they made a ton of effort plays, where we didn’t necessarily. 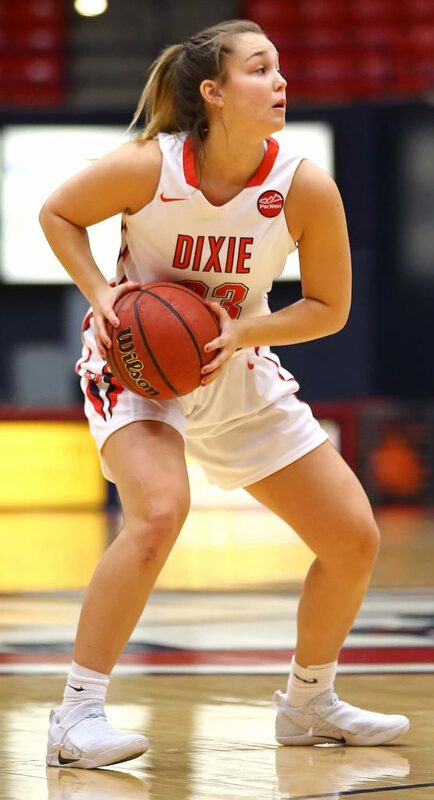 Baldwin posted her second-straight double-double with 11 points and a game-high 11 rebounds to pace DSU, while Franks notched her first of the year with 10 points and 10 rebounds to go along with a team-high five assists off the bench. 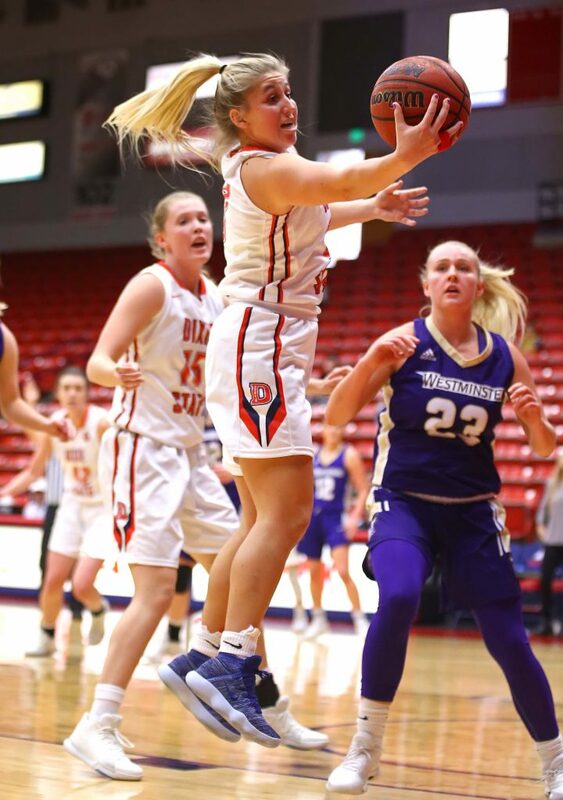 Moeaki finished with 10 points and Keslee Stevenson tallied nine points on three 3-pointers in 18 reserve minutes as the Trailblazer bench outscored the Griffin reserves by a 29-8 count. 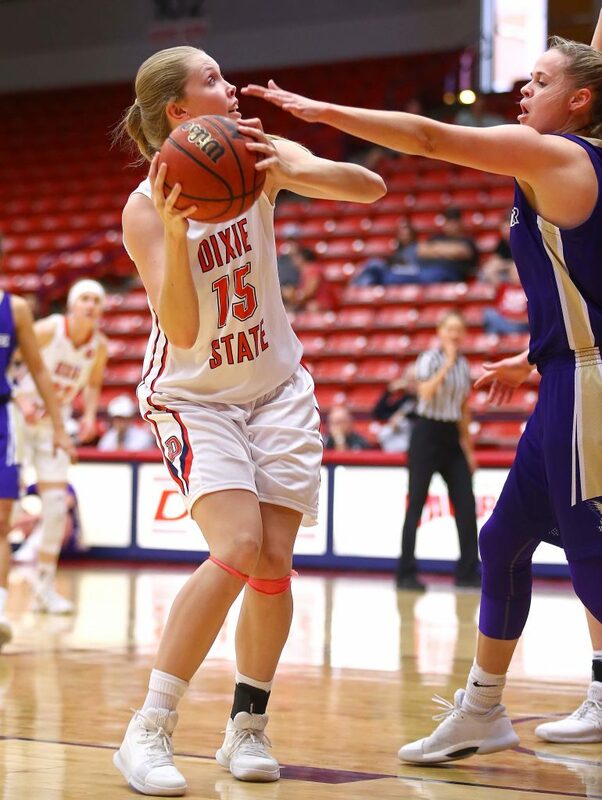 DSU shot 38.1 percent (24-of-63) from the floor, but was just 8-of-31 (.258) from the perimeter to along with an 8-of-14 day (.571) at the foul line. 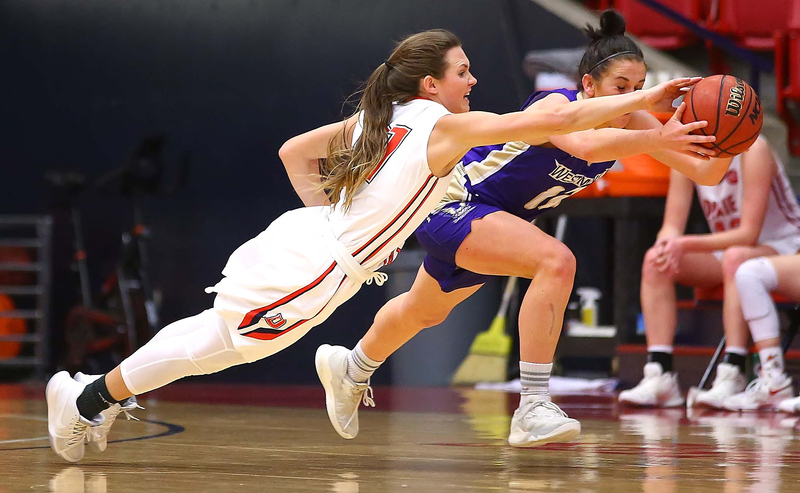 However the Trailblazers limited Westminster to 40.0 percent shooting (24-of-60) for the game, including at 34.8 clip from the second quarter on, and outrebounded the Griffins by a 47-31 count (13-3 offensively). 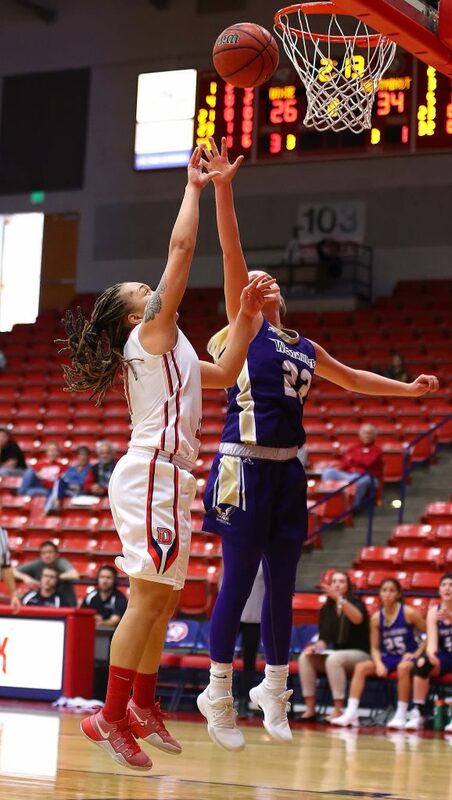 Gonzalez led all scorers with 17 points, while Taylor poured in 13 points with seven assists and four steals. 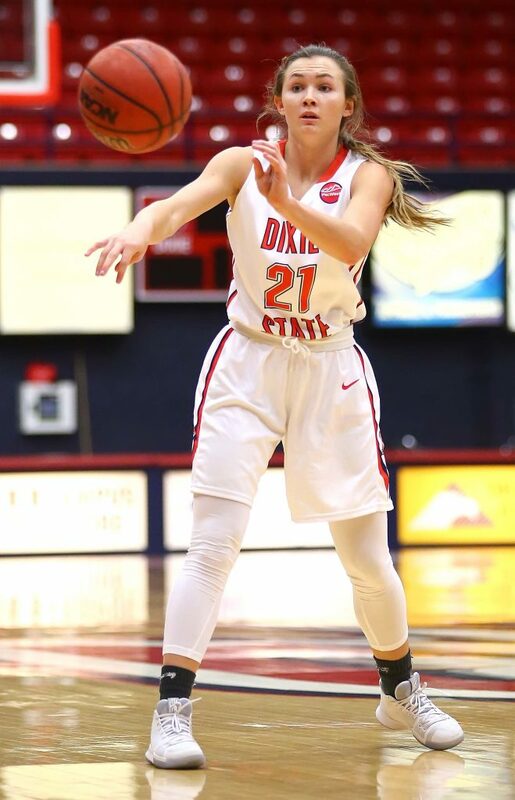 Dixie State will close out its 2017-18 non-conference slate with an exhibition tune-up in Orem at in-state foe Utah Valley this Tuesday night, Nov. 28, at 7 p.m. 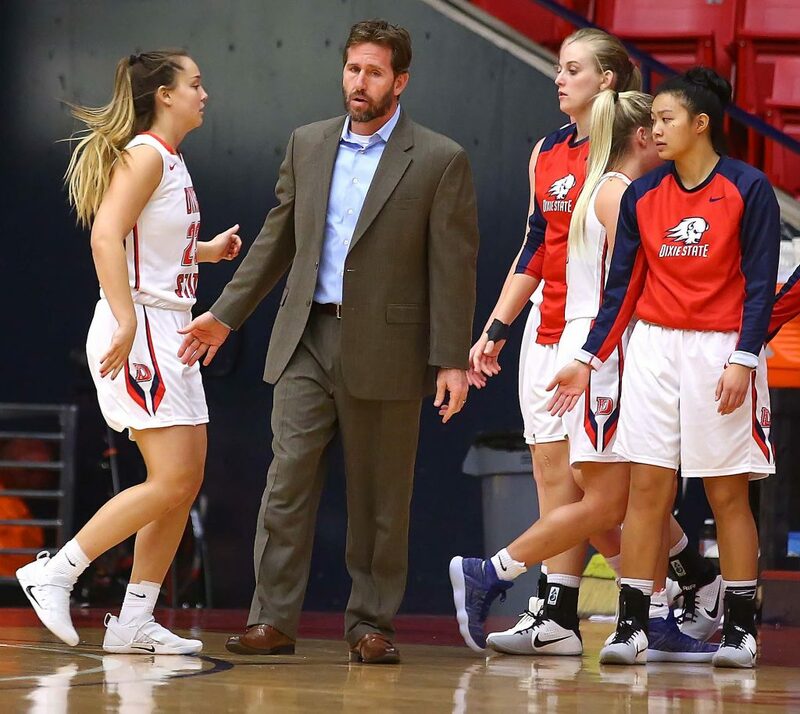 The Trailblazers then return home to the Burns Arena to open their final season of Pacific West Conference play next Saturday, Dec. 2, against Academy of Art at 1:30 p.m.
A second-half collapse led to the Dixie State men’s team to its fourth loss. 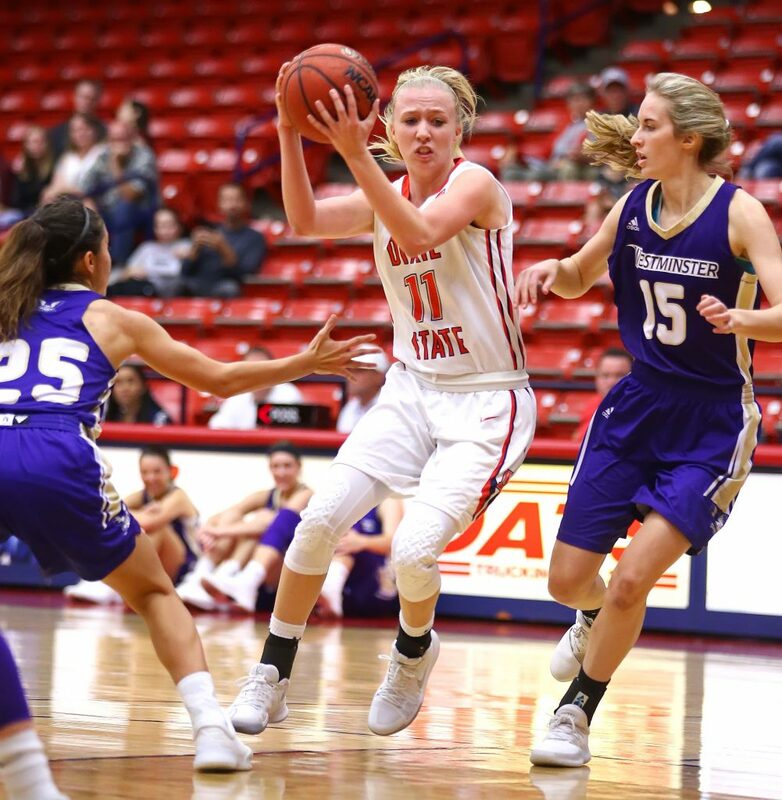 After leading by as many as 13 in the first half and shooting 43 percent, the Trailblazers could not find the basket in the second half. Trevor Hill opened the scoring with a three-point play. 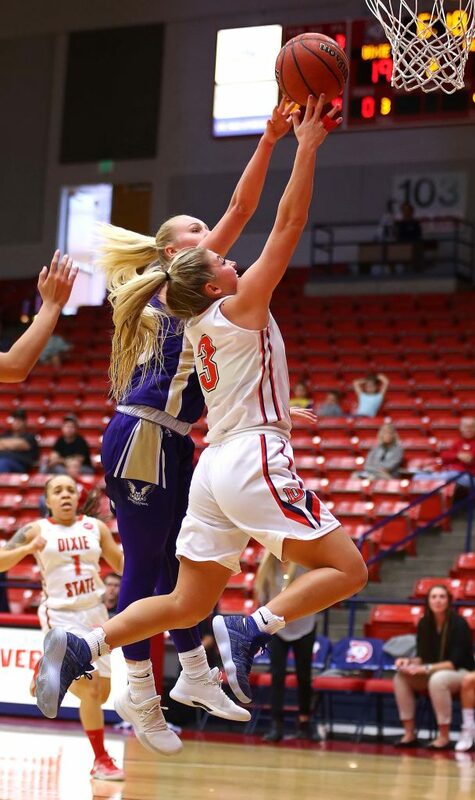 The Falcons tied it up with a 3-pointer that was answered at the other end by Kyler Nielson. From that point on, the Blazers led the rest of the first half. Brandon Simister took a feed from Hill beyond the arc at right center. His 3-pointer gave DSU a 14-7 lead with 14:31 on the clock. Brandon Miller entered the game shortly afterward. His first shot from 18 feet bounced out. It was rebounded by Austin Montgomery, who returned it to Miller who had taken a step back. This time Miller connected. His 3-pointer gave DSU a 17-9 lead with 13:13 remaining in the first half. 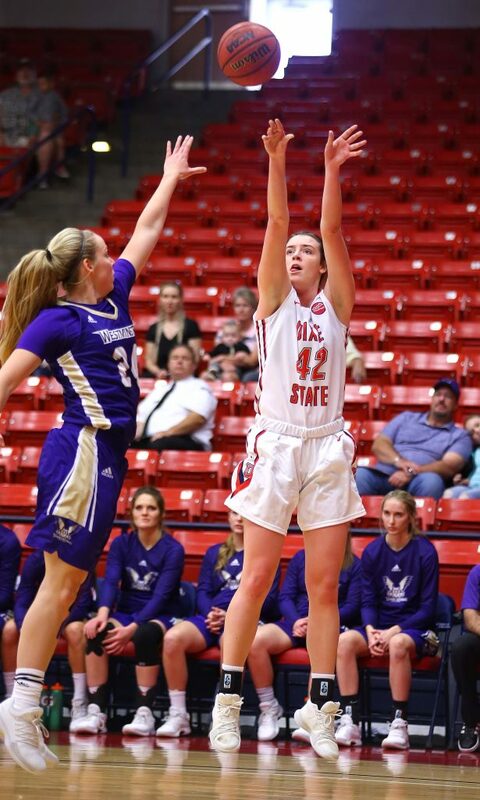 After the Falcons hit a 3-pointer at the other end DSU rattled off four straight buckets to go up 25-12 with just under 10 minutes remaining. 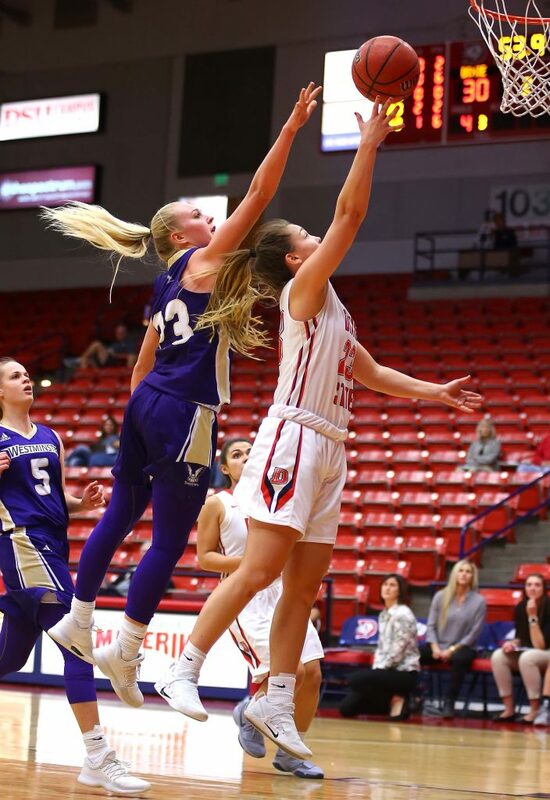 The Blazers would maintain a double-digit lead until the last second of the half when SPU completed a three-point play to trim the lead to 38-29. At halftime the Blazers held a 43-31 percentage advantage from the floor. 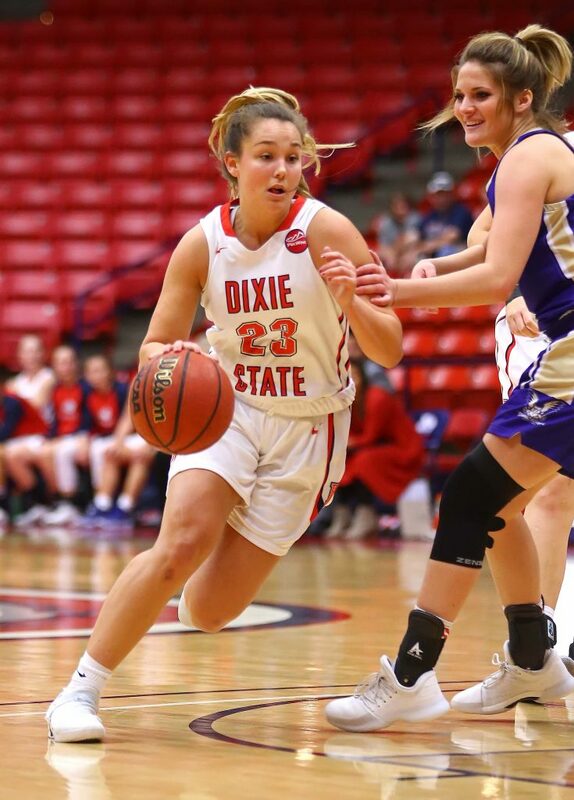 For the first time this year, Dixie State trailed in rebounds at the half by one 20-19. 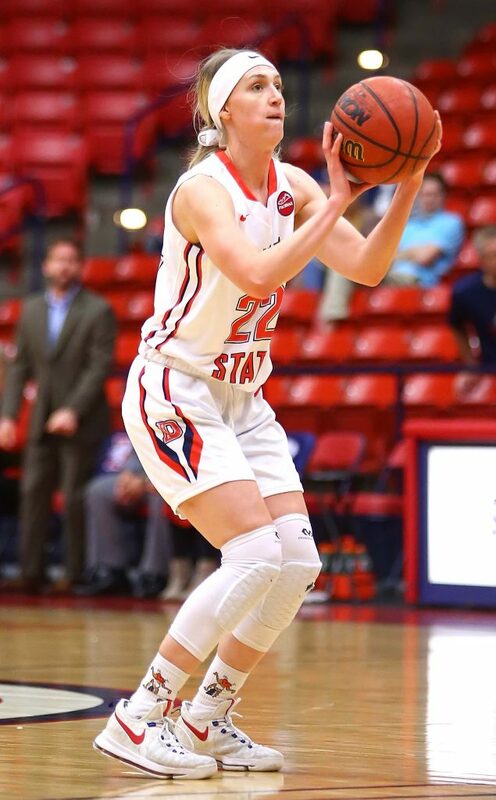 Individually, Hill led the team with 13 points. Simister and Nielson each had seven. While Montgomery failed to score in the first half, the big man drew two offensive charges. In the second half, the Falcons turned the tables on shooting percentage. With a few minutes gone, the Blazers still led by seven 44-37 on Zac Hunter’s jumper. But SPU went on a 13-0 run. 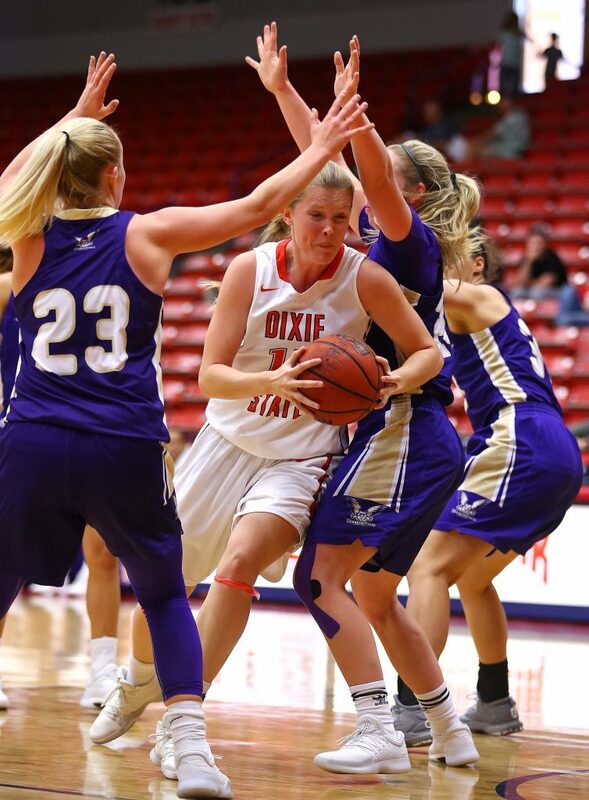 DSU had three turnovers and two missed shots in the run. The Falcon momentum continued after two Hill free throws and eight minutes into the second half, SPU had a double-digit lead 56-46. 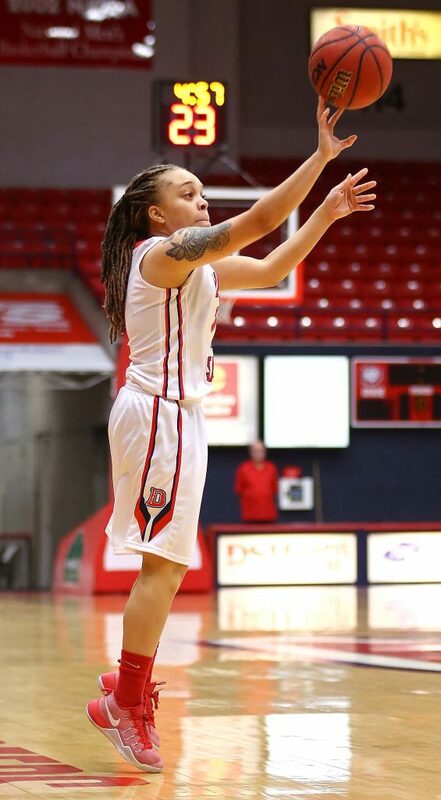 Daylor Youngblood cut the lead to four with a 3-pointer. The lead was four again on Youngblood’s second basket with 7:49 on the clock, 58-54. That was the closest they would get. SPU got the lead back to 12 points 72-60 with just under two minutes remaining. The Blazers would cut it to five, 75-70, with 30 seconds left. 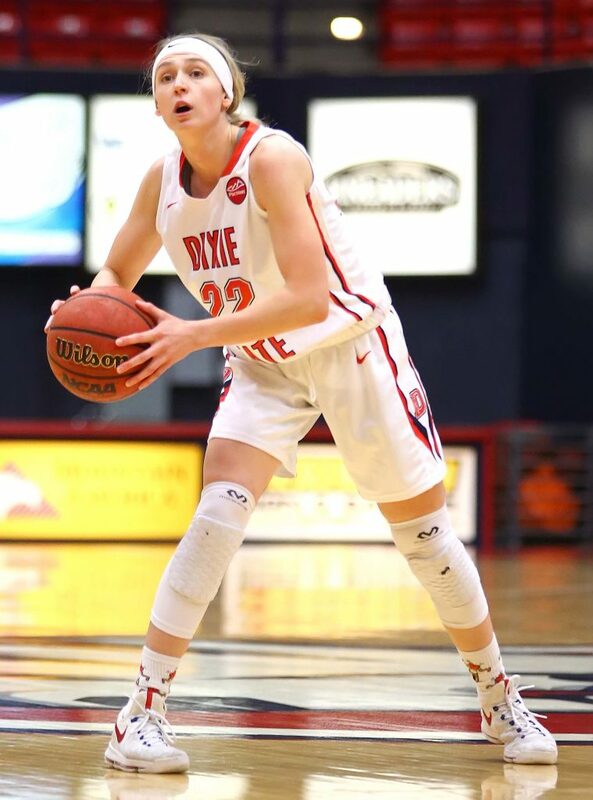 DSU had to foul to preserve clock, however and SPU hit their final four free throws to get to the final score. For the game, The Blazers were outshot 39 to 34 percent. They were also outrebounded 44-35. Hill led the team with 22 points, seven assists and four steals. Simister had 15 points. Isaiah Clark led the team with eight rebounds. The Blazers fall to 2-4 and will finish their non-conference schedule Saturday with a game against Dickinson State. Game time is scheduled for 5 p.m. at Westminster College.